The premiere episode of ‘We’re The Campbells‘ opened up with Erica on her radio show and praying with her children before school. GooGoo has started a new venture. She has launched a Glam Suite. 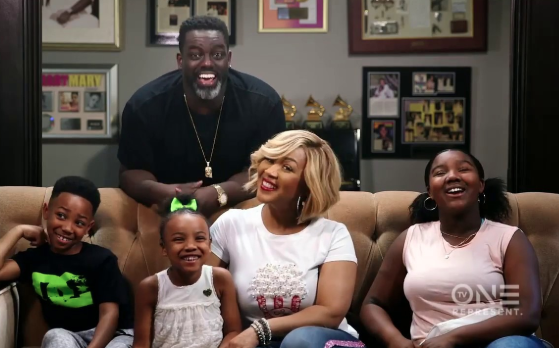 Erica and Warryn are trying to balance their love life, their parenting and professional lives. All of it calls to mind that we need balance. Life balance seems to be the topic on everyone’s mind of late. A well-balanced person has a far greater ability to focus their attention and energy on attaining their goals, taking productive actions and moving forward in a meaningful way. In today’s high speed, high pressure and high-stress world, it’s not just balance between work and family that’s hard to find. Turn it off and tune in to those you love. – Disconnect. Erica and Warryn opt to hav Sunday evening dinner together as a family. I hear the excuses already, but try it, at least for one day or even a few hours each night. Put the phone down and turn off the computer. Give your work brain a rest. Bonus: Spend the extra time actually interacting with your family and friends! Relationships do matter – The Campbell family is an extended family. Set aside quality time with your family and friends. Don’t just sit in front of the television, really connect and pay attention to those you care about. Make a date with your significant other, have coffee with a friend, play a game with a child. Really get to know the people around you. Warryn had to manage his sister’s career expectations. Remember fun – Laugh, joke, play, find your sense of humor, subscribe to a daily joke or get a tear-off calendar. Nothing makes the feel better as fast as a good old-fashioned belly laugh. Warryn and Erica’s confessionals are funny and light. When someone lives a balanced life everyone wins.